The boppi 4 in 1 Tricycle adapts and grows with your child – from the early days to the age of independent play. It has detachable and foldable parts that allow the tricycle to change from a parent powered-buggy to a pedal-powered trike when the child is old enough. 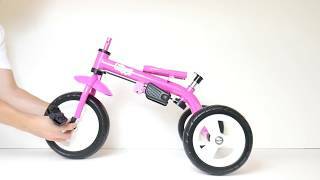 The boppi 4 in 1 Tricycle is available in pink, blue or green, and comes with all instructions and tools for assembly.